Hastings Voluntary Action gives “against all odds” awards for volunteers who have overcome their own challenges to help others through volunteering. The awards were established in memory of Fran McKeown who worked for HVA and was an enthusiastic campaigner for community action. Ruban Shanmuganathan was nominated by HFS for this award. Ruban contracted meningitis leaving him with memory and language problems. He also has arthritis in one hand, giving him a condition known as claw hand. Ruban has been living at the brain injury rehabilitation unit and making a good recovery. Volunteering at HFS has become part of his recovery programme this year. Starting out with one day per week in March, Ruban became more committed to his physiotherapy exercises because he wanted to be able to do more at HFS. He now helps move furniture in the prozac online drug store, takes apart and mends small items. We have seen huge improvements in his communication and confidence, feeling part of the team. He is also gaining better use of his hand by carefully lifting and carrying items with the support of the team. The rehabilitation centre has also noted the improvements which make having his physiotherapy (which he hates!) a little easier. Ruban now volunteers with HFS 2 days a week and plans to increase this soon because he wants to give more back to the community. We are very proud and thankful to have Ruban as one of our volunteers. Would you like to volunteer with HFS? Read more about volunteering here. 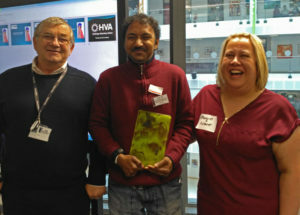 The photo shows Ruban with his award (a work of art by Linda Coad at SCCH), with Cllr Nigel Sinden from our Board of Trustees on the left and our volunteer support worker Angie Lowe on the right.